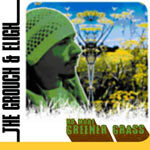 Grouch and Eligh team up with Up Above Records to drop the 2nd 12'' release off their latest album. Pigeon John grabs the guest spot for the title track and they basically let you know how they are feeling these days. On the B side, it's a previously unreleased track produced by none other than JROCC of the World Famous Beat Junkies! Tracks 1 & 2 produced by DJ Epik and 3 & 4 produced by JROCC of the Beat Junkies.